INEC writes Melaye, to commence recall process July 3 – Royal Times of Nigeria. As the quest to recall the senator representing Kogi west, Dino Melaye, gathers momentum, the Independent National Electoral Commission (INEC) has written a letter to the lawmaker informing him that it has received a petition for his recall. This comes two days after Melaye’s constituents submitted a petition and collected signatures to the commission. On Monday, Pius Kolawole, special adviser to Yahaya Bello, governor of Kogi, announced that 188,588 voters, representing 52.3 percent of the total number of registered voters in the district, approved the recall of Melaye. In a statement on Thursday, Mohammed Haruna, INEC’s national commissioner and member information and voter education committee, said the decision to inform Melaye was taken at a meeting held in Abuja. Haruna said INEC would issue a notice to the petitioners and Melaye on July 3, on when it would begin the verification of the signatures of those who signed the notice. “The Independent National Electoral Commission (INEC) held its regular weekly meeting today and considered the petition submitted by some registered voters from Kogi West Senatorial District to kickstart the process of recalling Senator Dino Melaye,” the statement read. “In accordance with the INEC guidelines for the recall of members of the national assembly, the commission has formally acknowledged the receipt of the petition to the petitioners’ representatives and has conveyed a letter notifying Senator Melaye of our receipt of the petition. “The next step is to verify that the petitioners are registered voters in the Kogi west senatorial district. 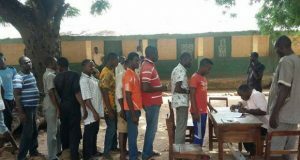 According to the electoral act, one-half of the number of registered voters in a constituency is required for the recall of a lawmaker. There are 360,098 registered voters in Kogi west. 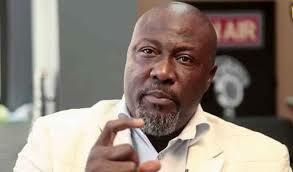 Melaye has said the move to recall him from the upper legislative chamber will land many people in jail. “It cannot succeed. It is a hoax and absolute comedy of errors. I’m laughing at the stupidity of kogi state government,” he had tweeted on Wednesday. “Many appointees will go to jail for forgery. Even dead people’s names on the recall register. “A governor who does not know what double registration is may not as well know the procedure for recall. Every lie has an expiry date.